Today we opened the application for the second class of the MergeLane accelerator. Our 2016 class — starting on February 1, 2016 – will comprise 10 fantastic startups with least one female in leadership. We could not be more excited about meeting these entrepreneurs. This will be our second class of MergeLane, and our first year was a fantastic ride. We met and graduated eight terrific startups. We saw a frankly astonishing wave of inspiring launches of funds and programs focusing on women in leadership as a business decision. We found ourselves on a burgeoning map around this issue. We won a wonderful $50,000 award from the US Government. I’m not going to lie: momentum is a really pleasant sensation. We are excited about year two. We have traveled around the country meeting fantastic female-led companies. We have scoured award lists and other databases to uncover startups that satisfy our criteria. We have talked to hundreds of companies, many of which were not even considering a startup accelerator. We have added phenomenal new mentors, investors, and speakers to our lineup. Apply sooner vs. later. We are doing rolling admissions, and it benefits you and your company to file a completed application soon. It is probably not too early. We know that many people – especially women – tend to not apply if they do not satisfy 100% of the application criteria. We want you to apply because we use a multi-factor analysis to evaluate teams, and not all those factors are official and disclosed. For more conviction, read this. It is probably not too late. We occasionally hear from companies that they think the fact that they’ve (a) launched an MVP; (b) raised some funding; or (c) begun bringing in revenue render them too late for an accelerator. We could not disagree with this more vehemently. Most of our companies in 2015 had material revenue and capital raised. The value of our accelerator – of any top-tier accelerator – is extraordinary and applicable at this stage of your business. Talk to us. If you have a company, I will personally set up time to talk with you about the fit between you/it and MergeLane. Email us to schedule a discussion. Looking forward to a phenomenal 2016 MergeLane class that hopefully includes you or someone you know and admire. 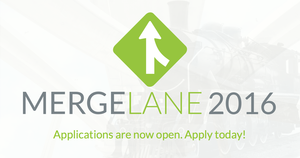 In case you missed it, the MergeLane 2016 Application is here.